Industrial control systems (ICS) are computers that control any automation system used in industrial environments that include critical infrastructures. They allow operators to monitor and control industrial processes and support the day to day operations of manufacturing, oil and gas production, chemical processing, electrical power grids, transportation, pharmaceutical, and many other critical infrastructures. Ever since the Stuxnet attack on modern supervisory control and data acquisition (SCADA) and PLC systems, there have been many vulnerabilities discovered and reported for these systems. Recent studies have shown that the documented cases of attacks to ICS infrastructures have exponentially increased from a few incidents to hundreds per year. In this blog post, we discuss common security architectural weaknesses in ICS. Figure 1 shows a typical architecture of ICS. Programmable Logic Controllers (PLCs) and Remote Terminal Units (RTUs) connect to sensors and actuators through a Fieldbus to gather real-time information and provide operational control of the equipment. These controllers also communicate to a data acquisition server (SCADA) using various industrial communications protocols. ICS relies on Human-Machine Interfaces (HMI) to configure the industrial plant, troubleshoot the operation and equipment, run, stop, install and update programs, and recover from failures. The day to day operational data is logged by the Data Historian component for further analysis and diagnosis. Each of these components has its own interfaces and can be the target of attacks that impact industrial equipment and operations. Our analysis detected 17 ICS components in 544 ICS advisory reports (55.06% of the entire corpus). 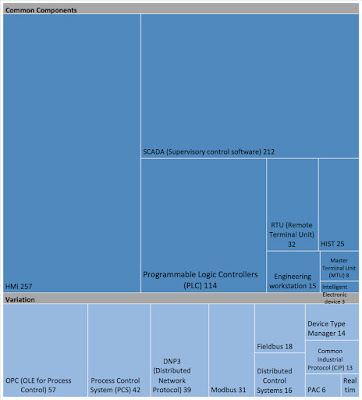 Figure 2 is a heat map showing the most common vulnerable components in these ICS advisory reports. The size of each block in the heatmap represents the frequency of a component. 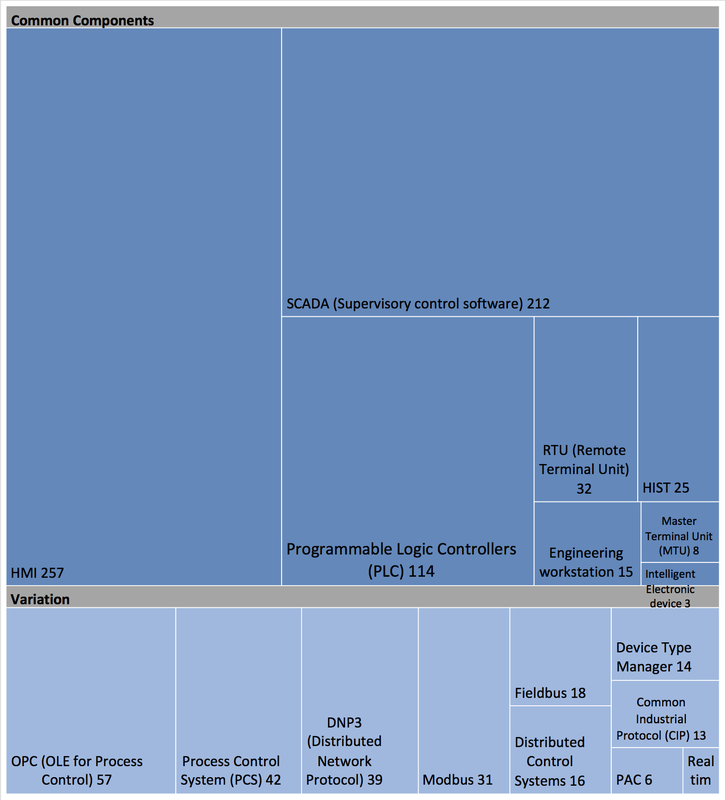 Human-Machine Interfaces (HMIs), Supervisory Control And Data Acquisition (SCADA) Software, and Programmable Logic Controllers (PLCs) are the most vulnerable ICS components. The remaining components were significantly less vulnerable. For instance, the fourth component impacted by vulnerabilities is OPC (reported 57 times) which is a software protocol based on Microsoft’s Distributed Component Object Model (DCOM), used by manufacturers for interoperability of industrial processes in real time. 62.86% of ICS vulnerability disclosures had an architectural root cause, while 37.14% of the vulnerabilities were due to coding defects. Table III shows the top 20 architectural CAWEs affecting ICS. 1) Improper Input Validation: This weakness occurs when an ICS component either does not or incorrectly implements Validate Inputs tactic. Our analysis indicates that this weakness can be present in every ICS component and the consequences often results in a denial of service attack. For instance, ICSA-14-079-01 reports two vulnerabilities impacting Siemens SIMATIC S7-1200 Programmable Logic Controllers (PLCs). The crafted packets sent on 2 specific ports could initiate a special “defect mode” on the PLC device. The subsystem receiving the packets fails to validate, thus causing a vulnerability that can be exploited remotely and causes denial-of-service. These vulnerabilities were viable since the devices were accessible through the internet, however, they were mitigated by Siemens new versions of these PLCs. 2) Improper Neutralization of Input During Web Page Generation (’Cross-site Scripting’): This weakness occurs in an ICS component that has a web-accessible UI, but does not or incorrectly “neutralize” input provided by one user (commonly a web request) than is subsequently used to generate web pages which are served to additional users. With this flaw, attackers can inject client-side scripts into web pages viewed by other users. This weakness is related to the Validate Inputs tactic, however, it is limited to ICS components with web-accessible UIs. In contrast, the previous weakness (CWE-20) presented the cases that attackers could implement a denial of service attack using a crafted input, that did not necessarily involved web applications. ICSA-15- 342-01 describes a cross-site scripting vulnerability affecting XZERES 442SR Wind Turbines. The web-based operating system of the turbine generator did not properly neutralize incoming web request content. This vulnerability could be exploited remotely and could cause a loss of power for the entire system. 3) Improper Authentication: A common design weakness discovered in ICS is that a component fails to or incorrectly verifies the identity claims of an actor interacting with it. For instance, ICSA-17-264-04 reports that iniNet Solutions GmbH’s SCADA Web server assumed the SCADA is used in a protected network and did not implement “Authenticate Actor” tactic at all. However, the system was connected to the Internet. In another case, ICSA-16-308-01 describes vulnerabilities in multiple versions and models of Moxa’s OnCell Security software, which are cellular IP gateways that connect devices to cell networks. Access to a specific URL is not restricted, and any user may download log files when the URL is accessed. This can be exploited and used for an authentication bypass, where the malicious actor accesses the URL without prior authentication. 4) Improper Access Control: This is a weakness in Authorize Actors tactic that occurs when an ICS component fails to or incorrectly restricts an unauthorized actor from accessing resources or equipment. This weakness can result in privilege escalation, the disclosure of confidential or sensitive data, or execution of malicious code. ICSA-13-100-01 discusses a case that MiCOM S1 Studio Software which is used to configure parameters of electronic protective relays fails to limit access to executables, meaning users without administrative privileges can replace the executables with malicious code or perform unauthorized modification of the relay parameters. The malicious actor could also exploit this to allow other users to escalate their own privileges. Exploiting this vulnerability requires physical access to the device and it can’t be exploited remotely. The company provides mitigation strategies for users, but it has not been patched or fixed by adding appropriate security tactics. 5) Cross-Site Request Forgery (CSRF): ICS components may not verify that an expected and/or valid request to a web server was sent intentionally by the client (a.k.a. “forged” request). A malicious entity could take advantage of this weakness to force or trick a client into sending an unintentional request to an ICS component or equipment, which appears to be valid to the SCADA server or process controllers. ICSA-15-239-02 describes a cross-site request forgery (CSRF) vulnerability in the integrated web server of Siemens SIMATIC S7-1200 CPUs, which are used in Programmable Logic Controllers (PLCs). A user with an active session on these web servers could be tricked into sending a malicious request, which would be accepted by the CPU server without verifying intent. This can be exploited remotely, and would allow the malicious entity to perform actions to the PLC using the tricked user’s permissions. 6) Use of Hard-coded Credentials: occurred when ICS components stored any type of credential used for authentication, external communication, or encryption of data in readable formats (e.g. plain text) in discoverable locations. This weakness compromises an Authenticate Actors tactic in ICS, and enables malicious actors to implement authentication bypass exploits and make ICS components or equipment perform actions that require authentication or elevated privilege. This weakness was prevalent across all ICS components. For instance, ICSA-15-309-01 discloses a hard-coded SSH key in Advantech’s EKI-122X Modbus gateways, which integrate Modbus/RTU and Modbus/ASCII devices to TCP/IP networked devices. The firmware of these gateways contains unmodifiable, hard-coded SSH keys. Since these keys cannot be changed but are discoverable, they could be remotely exploited to intercept communication by a malicious external actor. 7) Improper Neutralization of Special Elements used in an SQL Command (’SQL Injection’): This is another weakness in ICS that affects implementations of the Validate Inputs tactic. It describes an ICS component’s incorrect or failure to “neutralize” user-provided inputs which are inserted as parameters to SQL queries, which can be exploited in SQL Injection attacks. In such cases the un-handled input is executed as part of the query itself instead of as a parameter. This can lead to the database unintentionally returning sensitive data or modification of the existing data. This weakness was mostly associated with components such as Human-machine Interface (HMI), Supervisory control software (SCADA) and variants of SCADA (e.g. Process Control System (PCS)). ICSA-14-135- 01 discusses a SQL injection vulnerability in several versions of the web-based CSWorks framework that is used to build process control software. The framework fails to sanitize or validate (“neutralize”) user provided inputs which are intended to be used to read and write paths. 8) Use of Hard-coded Password: Hard-coded passwords are passwords stored in plain text or easily decryptable formats that are located somewhere discoverable by malicious actors, who can exploit them to bypass authentication or authorization checks. This weakness affects implementations of the Authenticate Actors tactic in ICS products. For instance, ICSA-12-243-01 report describes a privilege escalation vulnerability in multiple versions of two varieties of GarrettCom Magnum MNS-6K Management Software, which is used for device management on managed Ethernet switches. An undocumented but discoverable hard-coded password could allow a malicious actor with access to a preexisting account on a device to elevate their account privileges to admin levels. With these elevated privileges, a denial-of-service attack could be rendered or sensitive equipment settings could be changed. 9) Insufficiently Protected Credentials: This weakness occurred when the ICS components used an insecure method for transmission (e.g. insecure network) or storage (e.g. plain-text) of credentials. This insecurity can be exploited for malicious interception or discovery. This weakness affects implementations of the Encrypt Data tactic. ICSA-16-336-05B discusses unprotected credentials which can be exploited in multiple versions of 3GE Proficy Human Machine Interface (HMI), Supervisory Control and Data Aquisition (SCADA), and Data Historian products. In these products, if a malicious actor has access to an authenticated session, they may be able to retrieve user passwords not belonging to the authenticated account they are using. However, it cannot be exploited remotely. 10) Improper Control of Generation of Code (’Code Injection’): This weakness occurs when the ICS components fail to or incorrectly “neutralize” user-provided input to remove code syntax. This can result in this code being executed when the input is used to generate a code segment in the software. This weakness affects the Validate Inputs tactic. ICSA-14-198-01 discusses a code injection vulnerability affecting some versions of Cogent Real-Time Systems, Inc’s DataHub, a middleware used to interface with various control systems. If a malicious actor has access to and creates a ‘Gamma’ script on the local file system, he/she can craft a specially formatted user name and password to perform a code injection attack via an ASP page to execute that script file. , we report these findings in greater details and present advice for practitioners, such as Isolate control system devices and/or systems from untrusted networks. M. Krotofil and D. Gollmann, Industrial control systems security: What is happening?, 2013 11th IEEE International Conference on Industrial Informatics (INDIN), Bochum, 2013. S. McLaughlin et al., The Cybersecurity Landscape in Industrial Control Systems, in Proceedings of the IEEE, vol. 104, no. 5, pp. 1039-1057, May 2016. Danielle Gonzalez, Fawaz Alhenaki and Mehdi Mirakhorli, “Architectural Security Weaknesses in Industrial Control Systems (ICS): An Empirical Study based on Disclosed Software Vulnerabilities”, International Conference on Software Architecture, Hamburg, Germany, March 2019.